Some exciting fixtures, 4 away 3 at home makes it very tough, but hopefully we'll stay up. We will learn alot about ourselves very quickly in this division and I expect a lot of lessons to be given to us over the course of it especially against the physicality of Meath, Kildare, Derry and Tyrone. A crazy giving us 2 aways to start off. I think we will struggle tbh. We have to beat Antrim away and Laois at home to have any chance, i dont rate donegal either, but McGuinness is there manager and he is the most negative around and playing a team in early feb where conditions wont be good will tough. We have to go to Antrim AGAIN! FFS that must be 3 or 4 years on the trot now. Have the two teams relegated from Div 1 at home and as usual (it seems to me anyway) only 3 home games. I'm a suspicious hoor but I'd love to know how these things are decided. The opening game (which if common sense prevails should be in Ballyshannon) is a crucial one, could be telling in the end. 7.30 would suggest Ballybofey under lights to me, i think its a joke we have 2 away straight away, your correct its the 3 time in a row at least and in concective yrs we have to go to casement, hopefully 3rd time lucky as we are yet to win there. Arent the County Board given a provisional fixture list and it goes from there, Im sure they asked questions about the 2 openers being away, going to Antrim 3 yrs in a row. I dont mind going to ballybofey tbh as its not far anyway from us, ballyshannon is a heavy pitch so it wont suit us imo... either way we have to hit the ground running. The final game Kildare v Sligo could be a huge game that decides it all? Sligonian - neither Meath nor Kildare would be regarded as physical teams. Kildare play at a decent tempo but Meath are eminently beatable on any pitch. Sligo have started the last two league campoaigns slowly - something that they need to correct this time out. I disagree with your point on meath and kildare not being physical, there alot bigger physically than us, is it even worth debating its that obvious. I disagree that we need to rectify starting slowly, honestly fck the league, get the team sorted, going for the fitness advantage at the start just gives a false impression of where the team is at. I disagree that we will going for league final place at the end, if we dont beat Donegal we will be relegated and im not to bothered as long as i see improvements towards the end with a fb, chb sorted and other areas strengthened. Sligonian, don't visistr the board that often but man you are wayyy off the mark on a number of counts here. Meath people are embarrassed by the concept of being regarded as physical. Meath teams of the past were - not these babies. They might have a few long fellas but not strong. Maybe Banty will fix that but they're soft at the core in the eyes of Meath people whpo feel they have a long way to go. Kildare play at a high tempo and play through the ball which I agree Sligo don't do... but they are not particularly strong - well conditioned yes but that is a different thing. As for the point about starting slowly, well frankly that is not worth debating. The ONLY way that this Sligo team will maintain its progress is by making sure it stays in Div 2. so that it is guaranteed a decent standard of football in every game that it plays over a period of years - not a few weeks over the summer. If they don't get a good start, that is in serious question - look at TYrone and Derry last year if you need guiodance and I shouldn't even mention Westmeath... Fine, the league fianl might be overcooking expectations but if they don't start with that ambition, they will have problems. I would completely agree re finding a CHB - which is the biggest by far of our problems - there are options elsewhere but believe me, from experience, 2011 is ALL about the league. Winning Connaught and then looking towards 2012 in Div 3 is failure. Winning Connacht is everything, everything........ for us in 2011. Its hard to believe that you think this way. Its accurate before a ball is kicked but i still expect us to finish up ahead of Laois, Donegal and Antrim, however everything hinges on the first game, if we lose to Donegal i cant see us beating meath or tyrone and then relegation looms but you never know. 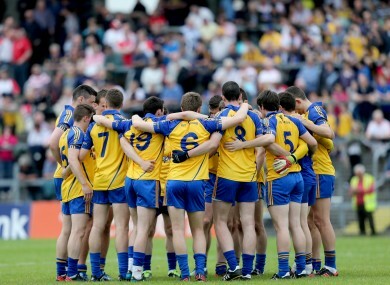 Odds dont mean much, i doubt it bothers roscommon that yer 12/1 and we are 10/3 to win Connacht in 2011. Not one bit & it's fair to say we both do better when the odds are against us. Just for the record i wont be commenting on here regarding sligo team anymore as i know too many players, im too heavily involved in coaching and its just not worth commenting on sligo matters anymore as my anonmity is gone long ago and whilst i have made many great friends on here and elsewhere and i have made enemies. Consider this my last sligo related post. Ii will continue to post on the general section. This sligo section is dead duck anyway although the views per post are pretty high. Sligo team is named and despite huge loss in Costello i still expect Sligo to win. We have to.